Release your worries the natural way with EASE for stress relief! 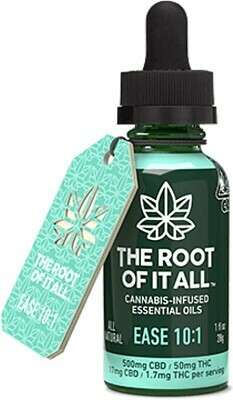 Our essential oil is made with a 10:1 ratio of 500 mg CBD / 50 mg THC to calm restlessness and promote comfort. EASE is infused with an Ayurvedic blend of lemongrass, bergamot, and ylang-ylang; ingredients known to promote tranquility, stress relief, and a quiet mind, naturally. Plant based, gluten free, vegan, and allergy friendly.